The App Center extends Confluence by offering users the ability to include links to web-based applications (Apps) that are being used within your company: Via a simple dialog, users can click and collect the apps that they use from a list of all available applications. Then they can go directly to exactly those applications that they need for their daily work - their personal App Center works just like apps on their smartphone (more detailed information in our Knowledge Base). A few days ago, our development team released version 1.3 of the App Center, providing more flexibility and new features for both users and administrators. The new version allows you to add and highlight apps with labels that make them more visible and usable. For example, the intranet team can provide a short description of each app's functionality or purpose. IT administrators can use an "Offline" label to indicate ongoing maintenance activities on their systems. One of our customers uses these labels to indicate whether the apps are work on mobile devices. The practical uses of these labels are endless. Administrators can enable an additional free text field in the app configuration and fill it with whatever content they want for each app. This information is then displayed when you look at an app's details. This alternative field can contain specific details about the app: supported operating systems, department in which the tool is used, purpose of use, and so on. One of our customers uses this additional field to indicate a support group in addition to providing contact information. The larger an organization becomes, the more extensive the set of tools and systems it uses. This configuration option helps to divide apps into more granular categories. Users can already see the available apps on their selection screen, sorted by type and use. But what if there are too many applications in a particular category? In large software development companies there are dozens of applications that belong in a "developer tools" category. With this new version of the App Center, you can create additional subcategories in its configuration. This makes the app selection process more straightforward and helps users select their personal apps faster and with less effort. In the standard system, categories when selecting apps are displayed in alphabetical order: accounting tools are listed first, then developer tools, then marketing tools, then reporting, and so on. But in some organizations, a certain category of tools are more important than the rest: Intranet users should be able to see and select these quickly and easily. The App Center now meets this requirement: Categories can be sorted manually, so they don't have to be displayed in alphabetical order; administrators can position the most important categories first. The tools used in teams and companies come and go, and of course the App Center is not static: Application links can be removed and added whenever you want. When new apps are added, you can now highlight them visually for a certain period of time and make them more visible to users when they select apps. You can also send an email notification to all intranet users to tell them about the new app and provide them with additional information where necessary. Administrators can now inform employees efficiently about new and helpful tools and support the adoption process. If you want to integrate your personal App Center into a Confluence page, you can do this in various ways. Do you want to list just your own apps? Or do you want to display all available apps? 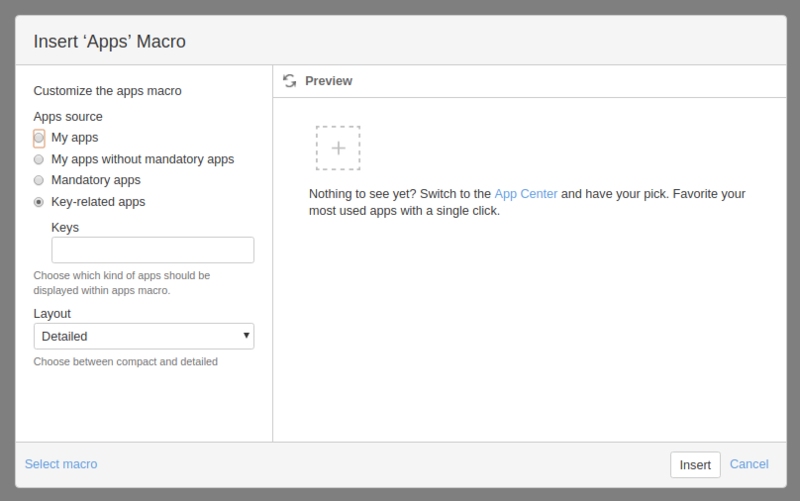 The App macro supports these options: My apps (the default selection), my apps without mandatory apps, only mandatory apps, and an custom selection according to the app keys. Version 1.3 makes it much easier for administrators to manage and add apps. In previous versions in the app overview backend, the URLs of the apps were listed, but these were not linked. This has now changed: All links are active and link directly to the applications. Do you want to quickly test the link again before saving the configuration? One click from the administration dialog is enough. With version 1.3, the App Center gives Confluence administrators and users a variety of new small but useful features to work with apps in a way that makes sense for their organization. The release offers more details, more clarity, more context, more presentation customization options, and even more support when rolling out new tools. By the way, we've renamed App Center to be Linchpin Launchpad. 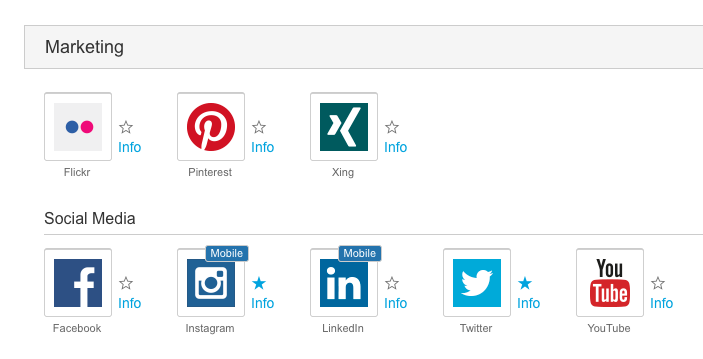 Did you know it is one of the core apps in Linchpin, our Confluence-based social intranet suite? Linchpin Launchpad is a building block in our Confluence-based social intranet suite Linchpin, but can also be used separately in all Confluence instances. 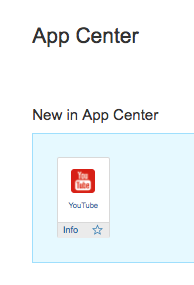 Go to the current App Center version on the Atlassian Marketplace.